We love autumn when butternut and acorn squashes come to market. We have one of the fall squashes in some form at least once per week and both husband Jim and I adore these golden fleshed squashes. 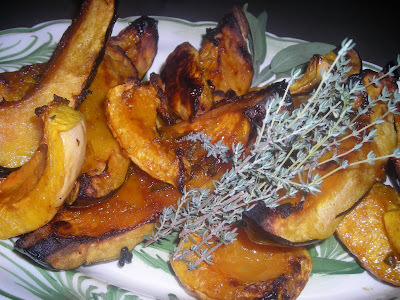 With a big acorn and a small butternut in the vegetable bin, I decided to try this recipe for Cider Roasted Winter Squash. From the latest issue of Cottage Living. Actually, the second recipe from this issue that I've tried. The first being the Caramel Apple Upside Down Olive Oil Cake. That recipe was certainly a winner. With fresh thyme and sage from the garden, it certainly is a keeper and it is so good that I am planning on having it on the Thanksgiving menu. It will go as well with roasted turkey as it did with grilled pork chops. Preheat oven to 400. Whisk together first 4 ingredients in a large bowl. Add acorn squash and remaining ingredients and toss to coat. Place vegetables in a single layer on a shallow baking pan and roast at 400, turning once for 50 to 60 minutes or until tender and light golden brown around the edges. Serve immediately or at room temperature. What I like best about this recipe is that you don't have to peel the squash -- winter squash is not the easiest to peel! Martha, Thank yiou for taking the time to stop in and leave a comment. Yur squash looks delish and I'll have to try your brandied fruit. I bet you like good fruit cake also. My mom makes a really good one, I can hardly wait until Christmas. I'll have to share your recipe with her for the fruit.